I just love using pink for wintery scenes. I actually HATE winter but I don’t mind crafting that focuses on winter because I am warm and snuggy in my house while I work! And snowflakes are so pretty! 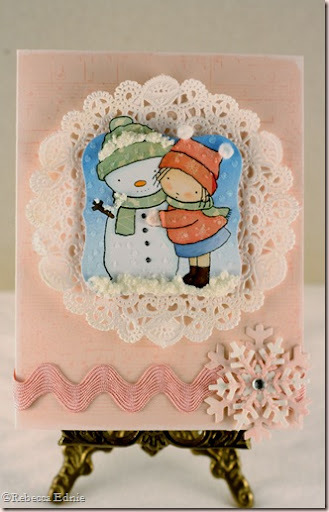 The background was stamped with a music background in sweet blush ink. Then white ink was swiped along the edges for a frosty look. I toned down the super white doily with distress ink because they white was just too stark, especially since my ‘snow’ turned out a bit yellow/ivoryish. 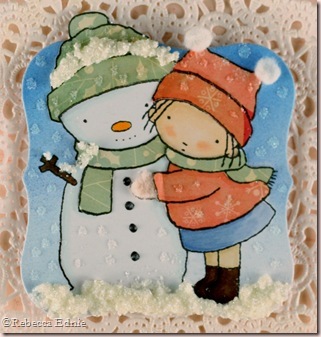 Speaking of the snow, I used Tim Holtz recipe for UTEE snow. You mix 2 parts white UTEE with 1 part clear UTEE, a dash of white glitter and moisten that to a paste with Glossy Accents or similar clear drying dimensional glue. Then apply very carefully, use gloves if you aren’t using a tool or spatula, wherever snow would naturally fall on your image. It is great too for placing on the top edges of chipboard letters or other dimensional objects as it sits along the top edge nicely. That is how Tim used it on a 12 Days of Christmas tag a couple years ago. I actually used one part each white and clear UTEE but I wished I hadn’t because I think it would be whiter otherwise. 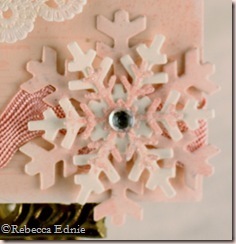 The snowflake was cut using MFT new snowflake dies from shimmery white paper. I sponged the base snowflake and the top snowflake with the same pink ink. I looked high and low for a white/clear rhinestone brad but I only had coloured. So I know what I am getting the next time I go to Michaels! For the background, I wanted it to appear that snow was falling so I took a fine tipped glue pen and put tiny dots of glue over the image and added white glitter. In case you are wondering, the snow accumulated only on the snowman and not the little girl because the snowman has been outside much longer! This card is so dang cute! I love your paper piecing and LOVE that color combination you chose. It's so sweet! cute card love your little girl -so sweet.